You’ve been bitten by the wine bug and you want to start putting together a cellar and collect Bordeaux wine. What do you do first? Prices are rapidly increasing and you want to get in on the ground floor. Do you instantly rush out putting your credit card to use, valiantly hoping to fill your empty cellar and start to collect wine as fast as possible? No! Why not? That is the single most important question new collector’s should ask. It is easy to go into a store wanting to start to collect wine and buy endless amounts of wine. But that is the worst move a novice collector could make. The best thing anyone new with the desire to collect Bordeaux wine can do is become an educated consumer. It is imperative in your informative years to taste as many different wines as possible. It does you no good to have a cellar filled with famous names and high scoring you don’t like. High scoring wines denote quality. But that has nothing to do with personal taste. While you will probably enjoy highly rated wines the majority of the time, big scores are not a guarantee that wine is produced in a style you are going to like. There are thousands of great wines produced in a myriad of styles and the only way anyone can decide what they like is by tasting as many different wines as possible. That is the key for everyone who wants to collect wine. It’s easy for new and seasoned collectors alike to taste a wide variety of wines and styles. Merchants often hold tastings. There are classes held by wine stores, auction houses, colleges, restaurants and even private people host them. You can join or form a group. It is easy to meet fellow wine lovers. Ask your local merchant to introduce you to collectors. Or, join a website devoted to wine and meet other devoted wine fans that live near you. The most popular, active wine website for people who want to collect Bordeaux wine in the world is hosted by the world renown, wine writer and critic, Robert Parker. Regardless of how you decide on where to taste wines, before starting to collect wine, you need to learn what you like. You could very well enjoy wines recommended by friends, critics or wine writers. But you might also discover those wines are not for you. Your palate might prefer different styles of Bordeaux wine. Wine, like life, is all a matter of personal taste. What do you buy when you decide to collect Bordeaux wine? After you have an idea about the type of wines you want to collect, what do you do next with your passion to collect wine? Deciding what to purchase depends on your age, what is already in your cellar and the level of maturity you want to drink your wines at and most importantly, your available amount of disposable income. How do these factors determine the type of wines you buy for your cellar? Age is important. Younger collectors can purchase wines as futures or on release as they have the time to wait until the wines evolve. Older purchasers should be buying wines that are mature or at least close to ready. For example, for most people over 60, it does not make much sense to collect wine like the 2005 First Growths, as those wines could take 30 years to fully develop. The wines you already own will also shape your buying habits. For instance, if you have a collection of young wines needing years to come around, focus on purchasing wines that are drinking well today allowing you to wait patiently until your wines mature. Do you enjoy wines with the fresh, exuberance of youth, or is your preference for the more earthy, tobacco and spicy tones of mature wines? This is a key factor and there is no right or wrong answer as everyone does not agree on this. But it is important to know what you when you start to collect Bordeaux wine. Lastly, the level of available disposable income is of course the key factor in determining how you will collect wine, what wines and how much of those wines you should buy. Today is the best time in history to be a wine lover. There are great wines at every price point allowing anyone to build a cellar. While wine prices have increased in price over the past several years, the truth is, there are more great wines at lesser price points delivering immense pleasure than ever before. In fact, there are countess smaller wines from numerous terroir’s making better wine than many of the world’s most exalted names people were buying in the 70’s! If you are willing to be adventurous and explore a bit, you can put together a great cellar for not that much money which will pay ample dividends for years! Earlier in this article on how to collect Bordeaux wine , I mentioned needing to taste a myriad of wines to determine your likes and dislikes. This is another reason why tasting as many wines as possible before buying is so important. To get ideas on wine you want to taste, read as many different books and publications as possible. A good place to start, is subscribe to publications like or “The Wine Advocate” from Robert Parker, www.erobertparker.com. Numerous other information sources are available to collectors in every country. In Finland, which places their magazines and books in countless countries, you have Fine Wine has numerous publications and books to chose from. In England, you can read the World of Fine Wine magazine plus, Jancis Robison’s Purple Pages, Germany offers Uncorked, Scandinavian Fine Wine services Northern Europe, Fallstaf is published in Austria, France of course has numerous choices including La Revue du Vin and the new guide from Michel Bettane & Thierry Desseauve. Gamberro Rossi comes from Italy. Wine Estate is published in Australia and Spain is not forgotten with Revista del Vino. America offers a myriad of publications with; The Wine Spectator and Steve Tanzer’s International Wine Cellar along with other choices available as well. As you can see, regardless of where you live or what wines your prefer, there are ample publications all over the world to suit your needs and offer advice when it comes to people who want to collect wine. If you’re like me and Bordeaux is your passion, the single most important book no Bordeaux lover with the desire to collect wine can do without. It’s Robert Parker’s tome, “Bordeaux : A Consumer’s Guide to the World’s Finest Wines,” or for more general suggestions on a wide range of wines, “Wine Buyer’s Guide,” the 7th edition also penned by Robert Parker will be out shortly. A properly put together wine cellar is a fantastic asset, literally and figuratively. That’s what eventually happens if you collect Bordeaux wine. It can pay unparalleled dividends for decades, if not generations. A cellars primary benefit is an investment in pleasure. Laying down a wine you love, allowing it to rest for a decade or longer until it finishes going through its much needed evolution is what cellaring wine is all about. All the world’s great wines need aging. It is only when those wines have reached maturity that they begin delivering the amazing tastes, smells, textures and sensations that wine lovers have been rhapsodizing about for centuries. There are numerous other reasons people put together cellars and collect wine. For example: investment for profit or, gifts for your children and grandchildren. And there are even simpler reasons. It’s fun to collect Bordeaux wine! Who do you need to buy your wine from when you decide to collect Bordeaux wine? Once you’ve determined the age and types of wine you want to place in your cellar you are well on your way. But who do you buy from? Young wines can be purchased from several different sources depending on the regions you desire to focus on. Get to know your local merchant. Ask questions. Taste with them and try a few recommendations so they get to know your palate. If you don’t have quality stores in your area, use the Internet. www.Wine-Searcher.com is the world’s best wine search engine. Subscribe to Pro-version. For the minuscule amount of money it costs to subscribe, you gain easy access to a world of wine at competitive prices. Even if you have great stores in your area, no merchant can carry every wine you want. That is another reason to use the Internet. Get to know a few stores offering you a good relationship. The insider secret is, do not try and buy from too many different merchants. The best thing any collector can do is purchase from a few different stores again and again. This allows you and the merchant to get to know each other and when you need a favor, stores that you’ve purchased from multiple times are going to be willing to help you when you need it. That is going to important if you wish to collect Bordeaux wine. If you want to add older vintages to your cellar, there are numerous options. Most major auction companies hold several wine sales a year including Christies and Sotheby’s. Select wine merchants also offer older wines for sale. But purchasing older wine is not without pitfalls. The single most important factor in buying mature vintages once you decide to collect Bordeaux wine is, were the wines stored correctly? A wine in poor condition is going to deliver a poor tasting experience. Where do you start when you begin to really collect Bordeaux wine? You’ve tasted enough Bordeaux wine and you are ready to start buying. The point in the previous paragraph about wines being properly stored cannot be stressed enough. 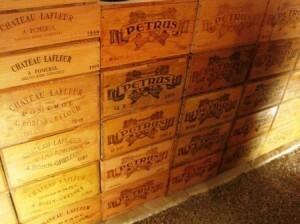 There is only one way to gain maximum pleasure from your mature wines and that is by storing them correctly. Wine is a living entity. Like us, wine goes through many stages before reaching maturity. Also like us, to ensure your wine ages and matures to the best of its ability, you need to take care of it. This means, regardless of where you store your wines, it needs to be in a proper environment. Wine is not meant to be stored in the back of your closet, under your bed or behind the stairs. Your wine prefers cool, dark, humid, vibration and odor free spaces. There are two types of cellars, passive or active. You’re going to need something or someplace to store your bottles if you want to collect wine. Active cellars have regulated climates keeping the cellar cold. 55 to 57°F (13 to 14°C) is optimal. Combined with 70% humidity, your wine will be very happy offering you perfect evolution. Over 70% humidity might rot your labels and much less moisture could dry out your corks. Passive cellars are usually underground with naturally cool and humid climatic conditions. Temperatures might rise in the summer and cool down in the winter. Problems associated with rising and falling temperatures are important. However the key point is how fast did temperatures change? Wine and corks are not fond of rapid temperature changes as that could damage the corks seal. If you are like most of us, you probably do not have a deep subterranean cellar or basement. So, what do you do? There are several choices. Cellars can be built in spaces from small to large to massive! The average cost to build an active cellar runs about $10 per bottle. If you do not have the room to spare, it’s easy to purchase units specifically designed to store wine in a myriad of sizes from 6 bottles to several hundred bottles. The Internet is the perfect place to look. If neither of those options fit your needs, most major cities have companies that rent storage for wine in temperature controlled environments. Ask your local wine merchant. A wine cellar is an investment in time and money. Do people make money investing in wine? Yes. If you buy the best wines in the top years, your wine will probably increase in value. But even buying the most in demand wines is not a guarantee of a return on your investment. While great wine has a track record of going up in price for hundreds of years, most wines are not going to offer safe returns. It’s a better move to buy the wines you like. Look at it like this, if world economy goes to hell in a hand basket, at least you’ll have great wine to drink! Cellar Management is the key to maintaining equilibrium with your collection. To ensure you do not need to open too many wines before they are ready, if you have the funds, it’s best to have a variety of wine at different levels of maturity. This is done by purchasing some wines with bottle age as well as vintages which show well for early consumption. For example, several 01 Bordeaux already offers a lot of pleasure today. Aside from wines that are for opening now, having bottles that need aging before they mature is the heart and soul of a great cellar. Young powerful vintages perfectly fit that bill.